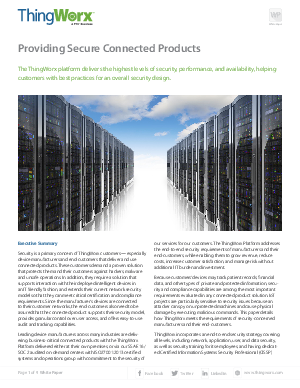 Security is a primary concern of ThingWorx customers — especially device manufacturers and end-customers that deliver and use connected products. These customers demand a proven solution that protects them and their customers against hackers, malware and unsafe operations. In addition, they require a solution that supports interaction with their deployed intelligent devices in an IT friendly fashion, and extends their current network security model so that they can meet critical certification and compliance requirements. Since the manufacturer’s devices are connected to their customer networks, the end-customers also need to be assured that the connected product supports their security model, provides granular control over user access, and offers easy-to-use audit and tracking capabilities.